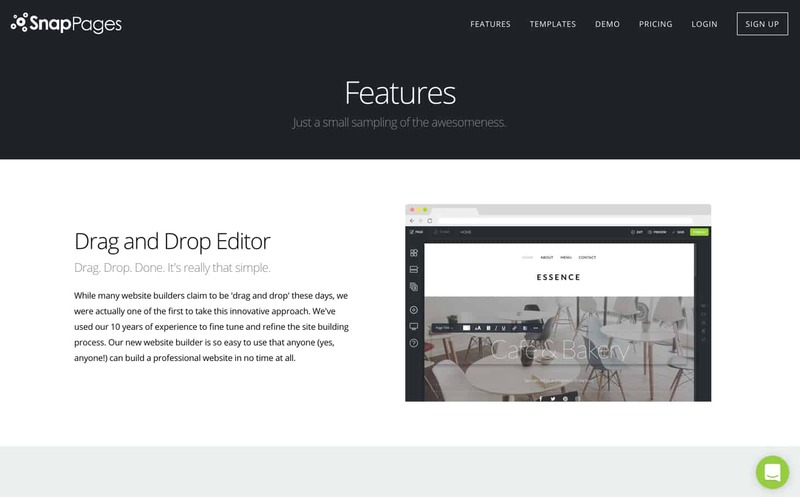 Looking for an easy-to-use site builder? Read our review to get important facts about SnapPages before you make your decision. 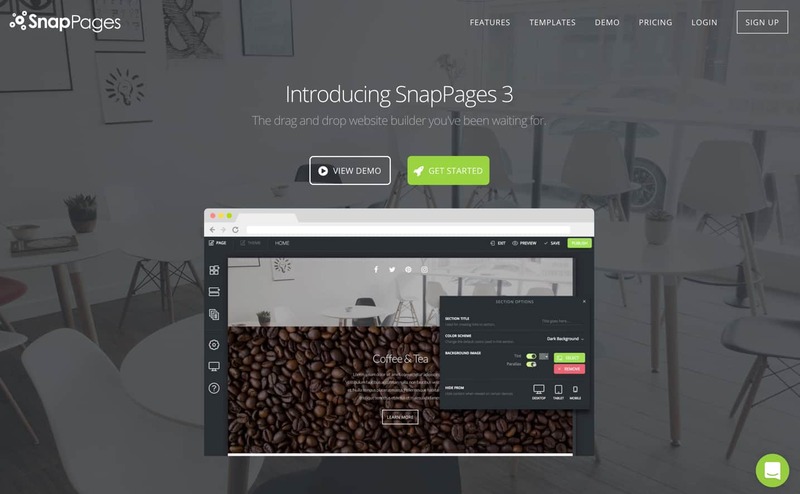 SnapPages is a site builder tool that launched nearly a decade ago. While the marketing copy on SnapPages’ website is similar to that of market heavyweights (i.e. Squarespace, Weebly, and Wix), our test drive surfaced inconsistencies. SnapPages executes some things flawlessly (like the frictionless addition of forms to pages). However, certain aspects of the platform’s functionality, and provision of customer service, leave something to be desired. This site builder may be a solution best suited to small businesses (or inpiduals) with minimal website needs and expectations. Let’s take a look at what exactly the SnapPages site builder tool has to offer and who may benefit from using it. So, is SnapPages a Good Choice? One of the more disconcerting aspects of the SnapPages website is the lack of information about the company. There is an About page but it just lists their launch year (2008), their “design philosophy” and a brief description of the product. There is no email address or phone number listed on the Contact page. There aren’t even any contact forms on their website; just a live chat box which isn’t live, but promises that “Ryan” will respond within a few hours. There is a knowledge base one can access. Now, just because SnapPages hasn’t published any information about themselves, that doesn’t mean the web has no trace of the company. TechCrunch has actually covered SnapPages a couple times — once when they launched in 2008 and again in 2013 when they came out with a new release. What we do know is that the company was founded by Steve Testone, it’s based out of Austin, and their goal is to simplify website building for users of all levels. So, have they achieved that goal? Not really. It comes with easy-to-use drag-and-drop functionality. Their themes are responsive in design. They provide tools to help users start blogging. And sites are hosted in the cloud. But the site builder is not as simple as they claim it to be. Plus, much of what they do offer in terms of the aforementioned promises is extremely limited. That said, I do believe there are some pieces of this site builder tool that make it a worthwhile investment for a certain subset of users. It’s just a matter of identifying its strengths in the context of the right user’s hands. If we look at what SnapPages claims to do versus the reality of the tool, there are some clear differences. So, let’s take this piece by piece and try to sort out what it is that users can reasonably expect to do with the SnapPages site builder. SnapPages talks a lot about the simplification they’ve brought to the website creation process. In other words, they’ve given users less options to choose from, but more room to customize. When it comes to the themes (or templates), that is true. Currently, there are only ten templates available from SnapPages and they’re easy to get started with. Users select the one they want and the pre-built template pages load into the unpublished site. As for the interface of the builder, at first glance it does appear clean and well-organized. Whoever redesigned this for their 3.0 release obviously spent some time in WordPress as it’s eerily similar to the theme customizer tool: the main dashboard always sits on the left and the real-time version of the site in the center. But that’s pretty much where the borrowed simplification from WordPress ends. Upon first entering SnapPages, users receive a tooltip-led tutorial to show them where the key parts of the interface are. The dashboard always sits flush left. The drag-and-drop functionality works flawlessly. They’ve accounted for the most popular items (called “blocks”) one might want to use to build a website (e.g. header text, images, spacers, forms, social media) and made them easy to add to the page. There are section templates offered as well so that users don’t have to build new sections from scratch. SnapPages enables users to build their site in a variety of ways: they can rely heavily on the design templates or they can build it out piece-by-piece with various blocks and sections. The dashboard will probably confuse a lot of users as it doesn’t remain the same throughout the website building process. It also switches from text-and-icons to straight icons — many of which don’t make a whole lot of sense in terms of what they represent. Once you enter the Pages section, there are new menus to deal with. There’s a navigation menu (which isn’t something a novice user may know how to use) as well as an additional toolbar at the top of the page. The toggle between the Page and Theme editing tools may present some challenges, too. It’s also unclear why they hid the Theme settings within the inpidual page editing interface and didn’t break it out as a menu in the dashboard. There are also two more settings/menu controls users need to learn once they begin editing sections of their website. I’ll talk about those below. I also want to note that the SnapPages tool is not fully responsive. When testing this out in a minimized window, the settings that enable users to Edit, Duplicate, and Delete a page from the navigation sub-menu are hidden behind the website preview. Not that this is a big deal, but it does have me wondering if the claim that their themes are all responsive is true. While the interface has its confusing moments, it’s not a dealbreaker. It’ll just require some patience and a learning curve. What does matter, however, is that users are able to create the kind of content they want to. Again, herein lie some problems. First, there’s the matter of the editing tools included with each section and block (mentioned above). There are two “popups” that appear next to each. One pops up in the top-left corner and offers limited editing options. The one on the right controls the section’s settings, but also enables users to turn the section into a slider (which will likely cause a whole lot of confusion and frustration when users accidentally activate it). Now, SnapPages is right: their builder tool includes a lot of room for customization. Users don’t have to stick to the templates provided. They can add new blocks of content and new sections, and then they can rearrange all of them easily enough with a simple drag of the mouse. However, it’s finding where all of those options are and figuring out how to use them with the different types of blocks, sections, and content that’s problematic. Users can create default settings to apply across their entire theme in terms of typography, color palette, and branding. Each page or post can deviate from those defaults, too, so users do have some wiggle room. The form building tool is awesome. It comes with a lot of options, so customization is a cinch. There are some basic SEO settings users can play around with for the overall site as well as for each page or post. Social media integration is included (albeit limited). Once users have figured out how to add a new section, creating the content is simple enough. Files can be imported directly from the user’s computer or text can be directly entered into the block. Blog posts and pages have the same content block options, so the consistency between those two areas of the site will help ease the user experience. Undoing a change is not easy. There isn’t an Undo button in this builder, so deleting an entire section by accident could cause serious issues. Images can’t be adjusted much. Users can add a title, caption, and link, but the sizing is determined by the preset dimensions of the block. The image gallery design is pretty outdated, and the animation, speed, and size controls are limited. The call-to-action buttons are not visually appealing. There are other content elements that just seem like they don’t belong or weren’t properly planned out, like the Download and Menu blocks. So while SnapPages’ claim that users don’t need to know how to program in order to build a website is true, users who don’t have that skill will be significantly limited by what they can achieve here. In order to use any of those elements listed above, users need to use the “Code” block to integrate third-party apps into SnapPages. It will require more work and probably won’t look that great since the connection to the app isn’t inherently built into the platform. The process of integrating third-party apps into the builder also goes against the whole “simple” promise of the platform itself. If you are interested in using your SnapPages site for e-commerce purposes, you can do so, albeit indirectly. This process is not the most straightforward option available, and with other all-in-one sitebuilders offering built-in e-commerce functionality, we might suggest going that route. One of the nice things about SnapPages is the tooltips that users receive when they first start using the builder. However, those tooltips don’t cover the full range of functionality within SnapPages, which leaves a lot of open questions if you’re new to the site builder or to building a website in general. Sure, a chat module is available, but users likely won’t receive assistance in real time. SnapPages does have a knowledge base available on their website (the link to which can be found in the footer or through the question mark in the builder). Although the knowledge base appears comprehensive at first glance, the guides aren’t all that easy to follow. Images are sparse and the lengthy texts explain what users would be able to figure out after poking around on the site on their own. In addition, many of the guides serve only to tell users that SnapPages can’t do something (like sell them a domain name or help them build an e-commerce site). What they really need are brief tutorials that show novice users how to get in and out of the builder with ease and how to create content with the tools they’re given. The rest can be covered in a quick FAQ that doesn’t mislead customers into thinking there’s more that can be achieved based on the quantity of knowledgebase articles available. Like with most site builders, there’s no need for users to purchase separate web hosting. However, this means they’re at the mercy of SnapPages cloud hosting network. Issues with downtime, latency, or security will totally be out of SnapPages’ users’ control and, unfortunately, there’s no transparency about any of this on the website. In terms of domains, this is something users will have control over as they’re forced to procure one from outside of SnapPages (unless they want to use a domain with SnapPages’ name attached to it). Users have two options: they can purchase a domain from another provider and then point the nameservers to SnapPages or they can go through the SnapPages’ builder to purchase one from G Suite. SnapPages does not offer SSL certificates for sale, nor does the company make any mention of buying your own and using it on the SnapPages website. If you handle sensitive data, you may want to speak with SnapPages representatives on how you can handle this information securely. SnapPages supports Google Analytics integrations. All you have to do is copy your unique Google Analytics tracking code and paste it into the Code Block section of your SnapPages website. SnapPages is a good option for many looking to get started with their website, but for small businesses, there may be better options. For example, those wanting an easy-to-use product that gets them both a website and an e-commerce presence might opt for Squarespace. Those who are interested in more feature-rich sitebuilders might consider Wix or Weebly (both come with better e-commerce support than SnapPages, too). In terms of what users get in exchange for using SnapPages, this is probably one of the most expensive builder tools on the market in terms of value. There are three pricing tiers available. This package is likely only a reasonable option for someone wanting to create a quick-and-dirty placeholder website for their small business. This package is the safest option to go with out of the three, though it’s still extremely limited in terms of what customers can do with their website. Advanced is the highest tier and probably created for web developers, though I’m not sure if this is really a developer-friendly platform. The only difference between this and Basic is that it includes more storage, advanced code editing capabilities, and offers priority support. One of the good things about SnapPages is that they offer a 14-day free trial period to test out the builder tool. You can try out nearly all the functionality, with the exception of the advanced editing, so if you’re on the fence about signing up, it’s good to know you have that option available. Before I wrap up here, I do want to issue a word of caution. As I mentioned earlier, it’s clear that the developers behind SnapPages 3.0 were inspired by WordPress. While WordPress is an absolutely great source to emulate, there is a lot of foresight and follow-through that goes into each new release or feature that comes out of WordPress. SnapPages did not do that with their most recent one. While the company seemed extremely proud of what they’d been able to accomplish in terms of simplifying the builder tool for users, they forgot to make it backward-compatible. Problem 1: Existing customers were forced to create a completely new account and website if they wanted to work on the 3.0 version of the builder tool (which they basically had no choice but to do). Problem 2: They then had to contact SnapPages to cancel their old account. However, since SnapPages can only be reached through chat, it took time for the cancellation/account switch to go through. Problem 3: Customers with a lifetime subscription discovered that SnapPages was no longer honoring that subscription if they canceled and re-upped in order to get version 3.0. Problem 4: While this switch may not have been a big deal for users with small websites, this proved to be a major issue for bloggers who had hundreds of pages on their sites. Since SnapPages had no way to save and backup content nor did they offer customers an easy way to copy their site over to the new account, this meant that customers had to recreate every single page of content, even if there were hundreds of blog posts. The makers behind SnapPages obviously created this builder tool with the best of intentions. The problem, however, is that they’ve drawn best practices from so many different sources — namely, Photoshop, WordPress, and their site builder peers — that it’s over-complicated the process of building a website. This is the exact opposite of the promise they make users. For a site builder that’s been around as long as SnapPages, you’d think they’d know by now what works. But in reviewing the latest release (3.0), it’s clear they’re trying to be too many things to too many user types and the execution of the tool has fallen far short of that goal. So, who is this good for, if anyone? Developers should most definitely stay away from this as should anyone with experience using a high-quality CMS or builder tool. 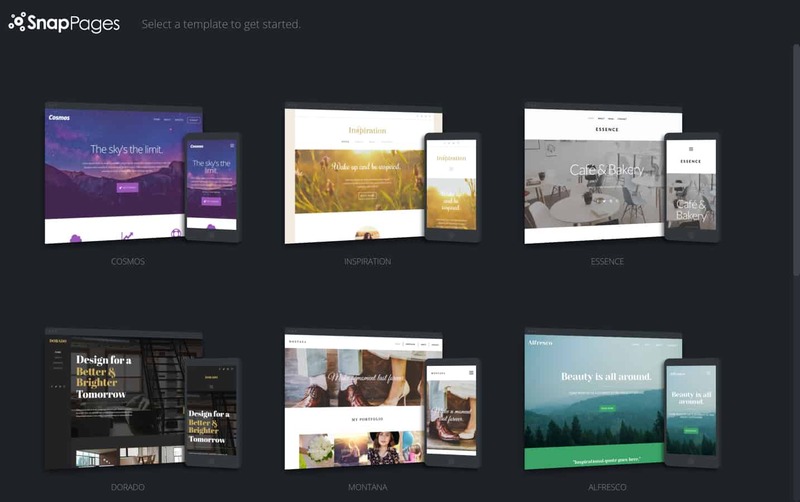 Realistically, this tool is for small business owners who need to get a placeholder site up very quickly or who want to rely on pre-built templates to build a new site from. Next: MoonFruit Review: A Site Builder with E-Commerce Features, but Is It Easy Enough for You?